The Inspection Panel is the World Bank’s independent complaints mechanism. Its mandate is to ensure that the voices of people who may be adversely affected by Bank-financed projects are heard, and to promote accountability at the Bank. The Inspection Panel is a non-judicial body that acts independently, impartially and objectively in evaluating the process followed by the Bank. 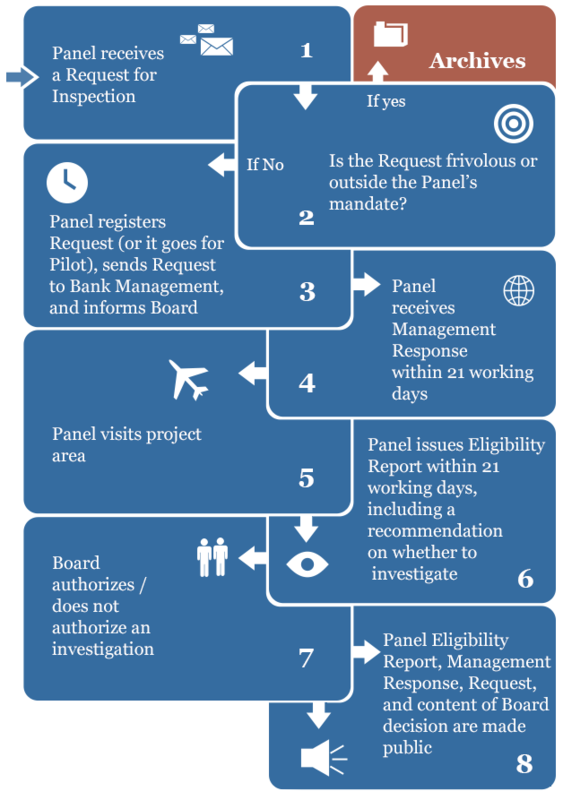 The Panel does not investigate unless it receives a formal, written Request for Inspection. The Panel has the power to review Bank-funded projects, and determine whether Bank Management is following the World Bank' s operational policies and procedures which were put in place in order to provide social and economic benefits, and avoid harm to people or to the environment. Any group of two or more people in the country where the Bank-financed project is located and who believe that, as a result of the Bank’s violation of its policies and procedures, their rights or interests have been, or are likely to be, adversely affected in a direct and material way. They may be an organization, association, society or other group of individuals. A duly appointed local representative acting on explicit instructions as the agent of adversely affected peoples. In exceptional cases, a foreign representative acting as the agent of adversely affected peoples. A World Bank Executive Director in special cases of serious, alleged violations of the Bank’s policies and procedures. They live in the project area (or represent people who do), and have been or are likely to be adversely affected by project activities. They believe that they may suffer actual or future harm resulting from a failure by the Bank to comply with its policies and procedures. Their concerns have been brought to the attention of Bank Management, and they are not satisfied with the outcome. Format. Requests should be submitted in writing in any language, and no specific form or format is required. The Request should be dated and signed by the Requesters or their representative, and may be submitted via mail or electronically, with any supporting documentation. Requesters may ask for confidentiality in the handling of the Request. The Inspection Panel is not authorized to proceed with requests under certain conditions. Fax: +1 202 522 0916 (Washington, DC). Mail: Inspection Panel, Mail Stop MC10-1007, 1818 H Street, NW, Washington, DC 20433, USA. For additional information, please read general guidelines on how to file a Request for Inspection. 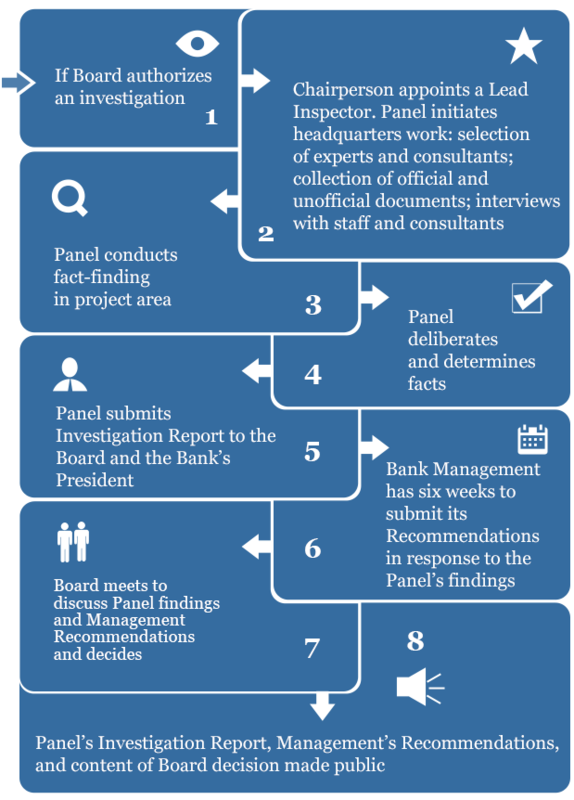 How does the World Bank Inspection Panel Work?